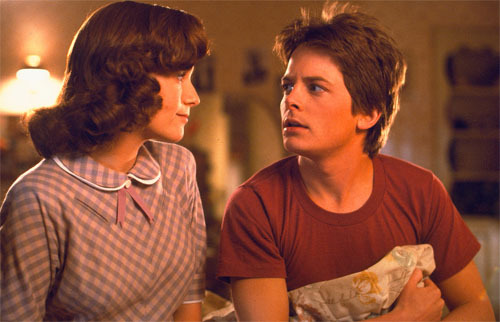 “Back To The Future” is one of those rare films that can be considered a classic for the ages. It appeals to everyone of all ages and genders. It was an original idea that was treated with care. The right cast, director, and script all came together in a way that couldn’t be duplicated (though they would try twice with two sequels and now a third time with the upcoming remake). I’ve seen this movie multiple times and it still manages to charm and touch me. Not bad for a movie that was originally sold as a simple high school comedy. By now the story is familiar to most movie goers. A teenager named Marty McFly (Michael J. Fox) takes a defense drive in a Delorium built by Doc Brown (Christopher Llyod) that also happens to be a tie machine. As a result Marty is accidently transported to 1955 where he unintentionally interferes with his parents meeting and now has to fix it. One problem (and boy are there a lot of problems) is that his mom now likes him as a result of the interference. His fathers a loser. Everyone’s being bothered by the town bully Biff. Not to mention there’s how to power the time machine to get him back to the future, which requires a whopping 1.21 gigawatts of power. All these situations are all dealt with in a screenplay that is smart and intelligent. It’s actually amazing how intricate everything is. It’s also amazing how many notes this movie makes. It’s a high school comedy. It’s a love story. It’s a drama. It’s an adventure. It’s about a kid trying to get home. It’s about a kid learning more about his parents and (in the process) learning to love them more. Finally it’s about an eccentric old man who discovers that he will accomplish something in life. 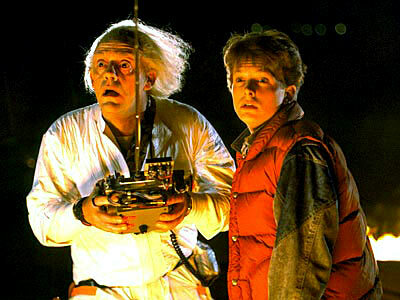 In fact, if there is one element in this film that works above the rest it’s the character of Doc Brown. He’s a scientist who is brilliant but seen as crazy by most of the world. There had been eccentric scientists in movies before this one, but I believe this was the first time audiences just accepted this sort of character and fell in love with him right from the start. That Christopher Llyod didn’t get a Best Supporting Actor nomination at the Academy Awards that year is nothing short of a crying shame. But I think the driving force behind why all this came together was director Robert Zemeckis. His movies have always had a great eye for visuals and characters with heart. This movie is no different. The special effects are practical and hold up well as a result. This could have easily been a flashy movie with little substance. Chances are it could have been just a high school movie with predicable (and unfunny) jokes. But Zemeckis is smarter than that. He knew that it was the characters people would remember. And really, all these characters are memorable and likable. 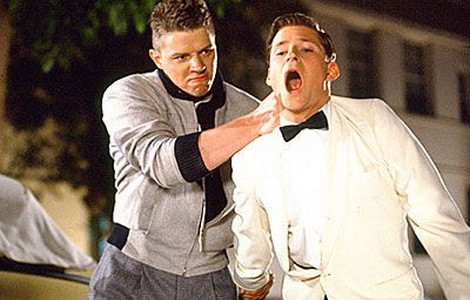 Even Biff is memorable because we like to hate him so much. You know you’ve got a great cast when the main character is the least interesting one of the bunch. However this film also has some great directing. 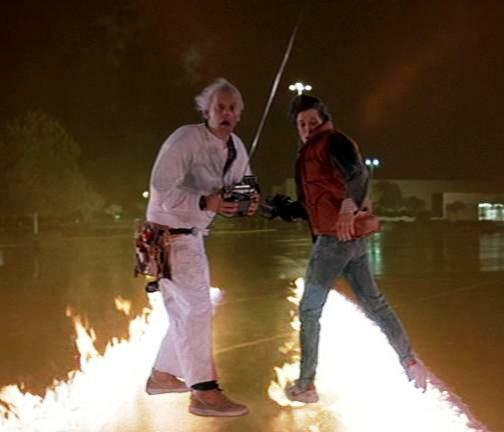 I can’t tell you how many times I’ve seen the final scene with the time machine and lightening storm, but it keeps me on the edge of my seat every time. That my friends is great directing at work. No one could have predicted how this simple movie would enter so many peoples hearts and stick with them. The world has changed a lot since this movie come out but the story and film itself feels timeless. No matter how old it gets I have a feeling people will always watch and enjoy this movie. I don’t care what the forthcoming remake does it will never diminish this films legacy. 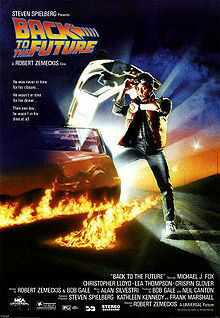 I hate to sound like a parrot (or use corny catch phrases) but “Back To The Future” is a timeless classic. Parents there is some shockingly strong language, a few sexual themes, and moments of intensity. Recommended for ages 10 and up.